Will play for first time since March 10, but Vigneault says Alexandar Georgiev will play again. GREENBURGH, N.Y. — Henrik Lundqvist didn’t look like a man who was back at work on Monday after a relaxing week off. Rather, he looked more like a guy who was just happy to get back in the lineup after being forced to sit and watch while understudy Alexandar Georgiev started three games in a row. Lundqvist will be back in goal Tuesday when the Rangers host Columbus at the Garden. Tuesday’s game will be the 36-year-old Swede’s first appearance since March 10, a 4-3 shootout loss to the Panthers in Florida that was his 800th NHL career game. That made him the all-time leader in games for a goaltender born outside North America and the 15th goalie overall to reach 800 games. He is the ninth Ranger — and first Rangers goalie — to reach the plateau. None of which means anything to Lundqvist at the moment. Right now, he is focusing on playing his best every time he gets the call and helping the Rangers (32-32-8) win as many games as they can. During the week when he wasn’t starting, Lundqvist said he took the “opportunity’’ to work harder in practice than he usually would at this time of year. 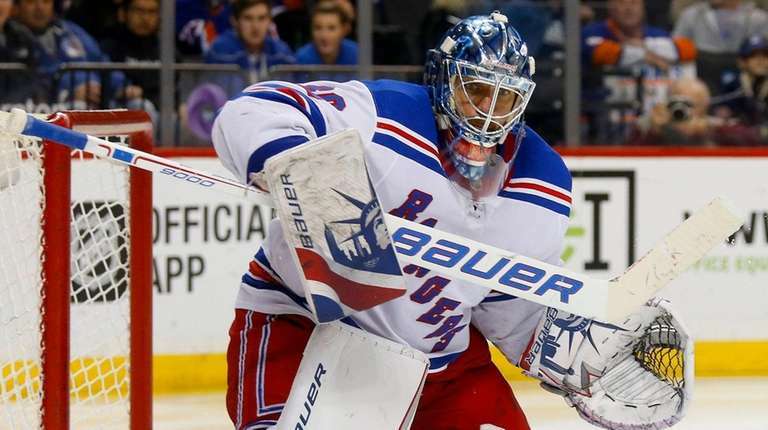 Coach Alain Vigneault reiterated that the Rangers need to see as much as they can of Georgiev so they can make informed decisions about his future with the team.